Will Kagame’s last push on AU reform bear fruit? This weekend, African leaders will be making important decisions on the future of the African Union (AU), its relationship with regional and international bodies, and how to strengthen peace and security responses on the continent. This will be Rwandan President Paul Kagame’s last big push to cement his legacy as AU chairperson before he hands over to Egypt’s Abdel Fattah el-Sisi in January 2019. Decisions expected at the extraordinary summit of AU heads of state in Addis Ababa centre on AU reforms, negotiations on the post-Cotonou agreement with the European Union, transformation of the New Partnership for Africa’s Development Agency into the AU Development Agency, and strengthening the African Peer Review Mechanism and the Peace and Security Council. Kagame’s African success story in taking Rwanda from the abyss of a genocide to a prosperous nation has bolstered his stature and that of his country. Kagame’s latest international achievement was securing consensus for the election of Rwanda’s now-former foreign affairs minister Louise Mushikiwabo, to the position of secretary-general of the International Organisation of the Francophonie. The Rwandan ‘miracle’ has however not come without criticism about the country’s poor record on human rights, civil liberties and political freedom. Many also feel there wasn’t enough consultation with member states during initial efforts to get the AU reforms adopted. Kagame was entrusted with reforming the AU in 2016. Two years later, heads of state should now be approving institutional changes around new recruitment and management procedures within the AU Commission. The other key reform – relating to the relationship between the AU and Regional Economic Communities (RECs) – is less clear. Commission chairperson Moussa Faki Mahamat, who has been working closely with Kagame, says this weekend’s summit has the duty to approve ‘the reform of the AUC in order to eliminate duplication in its structure and portfolios, enhance the selection of the senior leadership, and accelerate administrative and financial changes with a view to improving overall efficiency’. If approved, the structure of the AU Commission will change from the existing eight to six commissions: Political Affairs, Peace and Security; Economic Affairs, Trade and Industry; Infrastructure, Energy, Science and Technology; Social Development and Humanitarian Affairs; Environment and Agricultural Development; and Gender and Youth. The commission will in future be composed of eight (no longer 10) top senior officials – the chair, deputy chair and six commissioners. The AU Commission could benefit from better coordination between its departments, and so a non-elective position of secretary-general in charge of operational coordination will be created. The only change in the recruitment process of the commission’s senior leadership is that the screening, shortlisting and ‘campaigning’ will be more competitive, transparent and fair. Finally, on the proposed self-financing of the AU, leaders could at the summit vote to strengthen the sanctions against states that don’t pay their contributions. This is accompanied by the commission’s revamped budgeting and financial management system approved earlier this year. While the proposed changes in the AU Commission structure are commendable, decision makers must distinguish between streamlining and downsizing. Many feel that as much as the commission carries some dead weight, it is in reality understaffed. The chairperson is due to submit a proposal on a detailed commission structure to the AU’s Executive Council in July 2019. This must be designed in accordance with the division of labour between the commission, AU specialised agencies and the RECs. For institutional reform of the AU to occur, the specialised agencies, member states and RECs must rationalise their use of resources and cut down on duplication. This is no small task and remains to be properly tackled. In two years as chairperson of the AU reforms committee and nearly one year as AU chairperson, Kagame is about to succeed in changing the management of the continent’s affairs. If some of the reforms are adopted this weekend, the AU Commission could become better structured, properly financed and soundly managed. Specialised agencies such as the AU Development Agency and African Peer Review Mechanism could also become more efficient and contribute to an integrated and prosperous Africa. This will depend on if and how the reforms are implemented. 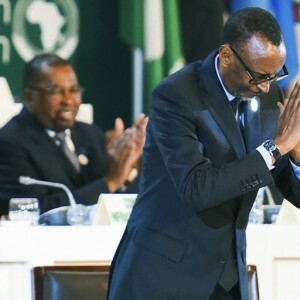 Perhaps more significant, in March this year Kagame spearheaded the launch and initial signature process of the African Continental Free Trade Area agreement, which eight countries have ratified. Rwanda was also the first country to sign and ratify the Protocol on the Free Movement of People. Kagame also oversaw the launch of the Single African Air Transport Market. Those represent big steps towards African integration. Nonetheless, the debate on AU reform has gone from imbuing the AU Commission and organs such as the Pan-African Parliament with some decision-making power, to simply reforming, perhaps cosmetically, the structures of African intergovernmental institutions. The rationale for delegating some power to African institutions is that they should be able to act on the aspirations of African people, beyond the narrow constraints of states that at times turn against their own citizens. While current reforms could contribute to a more integrated, prosperous and peaceful continent, the politics of national sovereignty will still present a major obstacle to addressing Africa’s pressing governance challenges.